Jubilee is a small Methodist church located on Cote Green Lane, Marple Bridge, Stockport. We meet every Sunday for worship in various different formats, with a congregation typically around 20. Because we are a small church, we are able to act as a close family and newcomers usually feel particularly welcome. Although the membership is ageing, we are young at heart and have a lively range of views on faith matters. 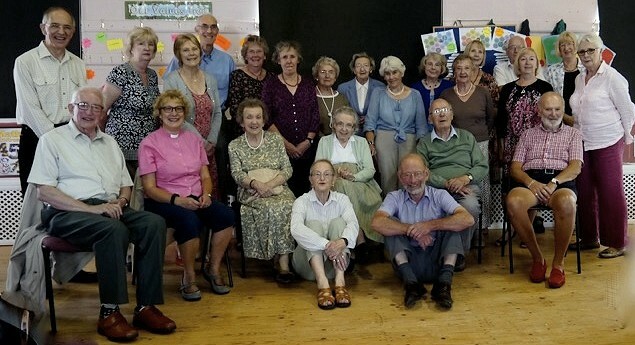 Our building provides a local community hall. The main charities that we support are Educaid in Sierra Leone, The Wellspring in Stockport and Christian Aid. The church building is on two floors with a traditional sanctuary on the upper floor with pews and a pulpit. On the ground floor we have a large hall with a stage plus a smaller meeting room with a kitchen area. Outside there is a graveyard and a small grassed area, suitable for outdoor events or for children to play on. The ground floor of the building is available for hire most evenings and weekends. We hold a traditional morning service at 10.45am most Sundays, except for the first Sunday in the month when we run our Sharing Café from 10.30am. Several weeks a year we do not hold a Sunday service but join one of the other local congregations instead. The traditional service consists of hymns, prayers, bible readings and a sermon, led by a minister or lay preacher. Holy Communion is celebrated once per month. 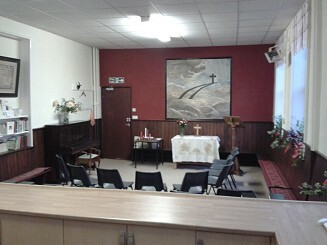 The service is usually held upstairs except in the winter months when it is held downstairs in the meeting room. Music is played either on the pipe organ, piano or digital hymnal. The Sharing Café is an innovative form of service which has now been held every month at Jubilee for the past ten years. It is an informal gathering with tea, coffee, soft drinks and cakes provided. The leader usually introduces a topic for discussion and ideas are shared in small groups around tables and then all together. The Sharing Café is attended by a number of people in the local community who have an interest in the Christian faith but are not necessarily comfortable with the traditional form of service. We also participate in regular shared services with our sister Methodist churches in the circuit and with Marple Bridge United Reformed Church. 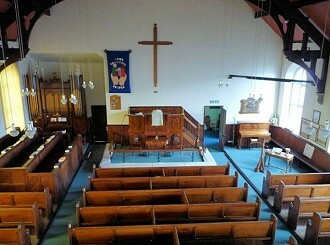 Within the Methodist Church structure, Jubilee is a class of Marple Methodist Church which is part of the Romiley circuit in the Manchester and Stockport district. The other churches in the circuit are, The Ridge, Romiley and Woodley. The circuit currently has two full-time ministers and a number of supernumerary ministers. We have close links with Marple Bridge United Reformed Church Church. The church was founded in 1833 as Compstall Primitive Methodist Chapel. It was rebuilt in 1867 and extended to two storeys in 1893, at which time it was re-named Jubilee. In 1932 the Primitive Methodists united nationally with the other branches of the Methodist church to form the Methodist Church of Great Britain. Between 1960 and 2000, three neighbouring Methodist churches (Hollywood, Mellor and George Street Compstall) closed down and most of their members transferred to Jubilee. For more information see My Primitive Methodist Ancestors.